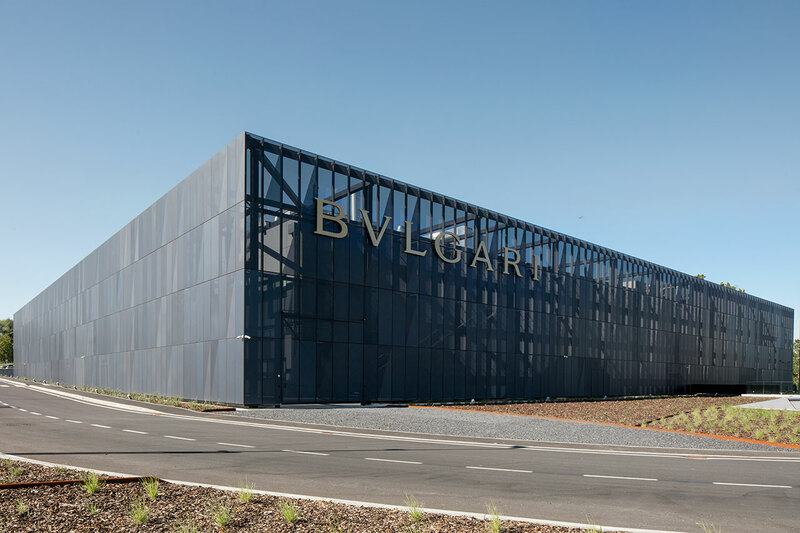 Compared to the history of Bulgari and goldsmithing, 18 months seem to be a very short period of time – although it is exactly how long has passed since it was laid the foundation stone of the new jewellery Manifacturing facility which Bulgari inaugurates in the historic goldsmithing area of Valenza. Manifattura Bulgari is a design by Open Project. With a total area of 15,000 square metres, it is composed of two buildings with completely different architectural characters, so as to create the perfect bridge between innovation and tradition. The soul of the facilitiy is tied to the cradle of Italian gold and silver working, expressed in the renovation of an existing building of great important historic and symbolic importance: the Cascina dell’Orefice – the Goldsmith’s Farm – was built in 1860 and is considered Valenza’s first gold workshop. 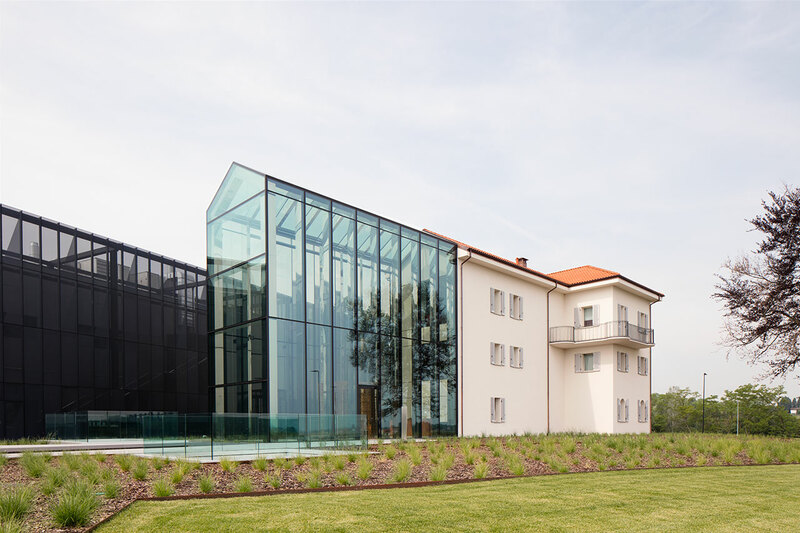 This historic building has been reconstructed and enlarged with a structure entirely made of glass recreating the Cascina’s original shape in a contemporary key. Known as the Glass House, it covers a total area of 1,200 square metres and is 13 metres high. 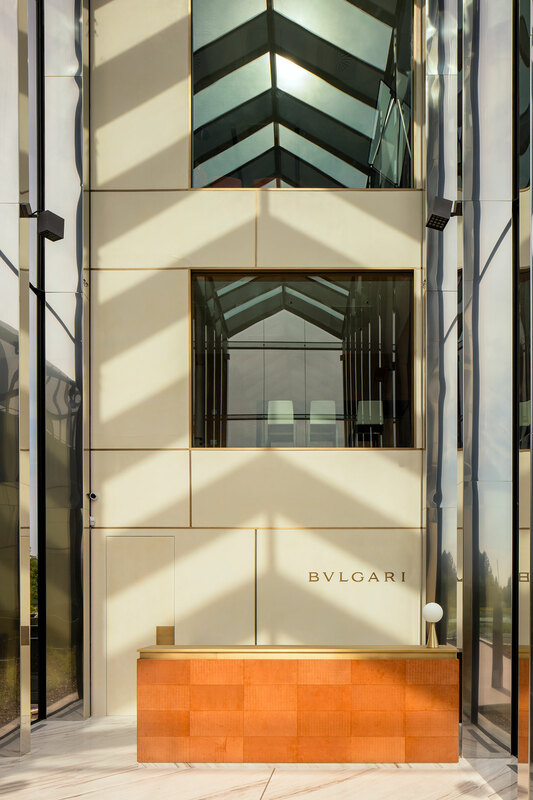 Housing corporate and reception areas, it holds both the strong historic identity of the site and also the unmistakable vision of Maison Bulgari which uses a return to tradition as a starting point to project into the future. The second building houses the manufacturing part of the facility. With its blend of aesthetics and efficiency, the building is equal to the architectural challenge of blending high-tech production capacity with a design that follows the brand’s style values. 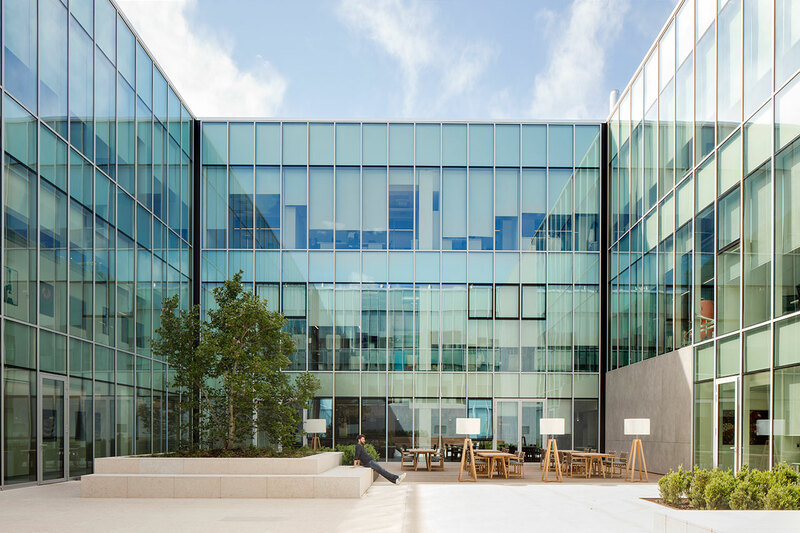 The building is over three floors, and surrounds a 600-square-metre courtyard that ensures a high level of natural light. The plant is completely wrapped in a metallic skin, six metres away from the outer walls, which combines an aesthetic function and practical use. It allows natural light to enter unobstructed, therefore there are no visual barriers blocking the view of the surrounding countryside, bringing aesthetic harmony to the structure and at the same time ensures a suitable level of privacy and security. 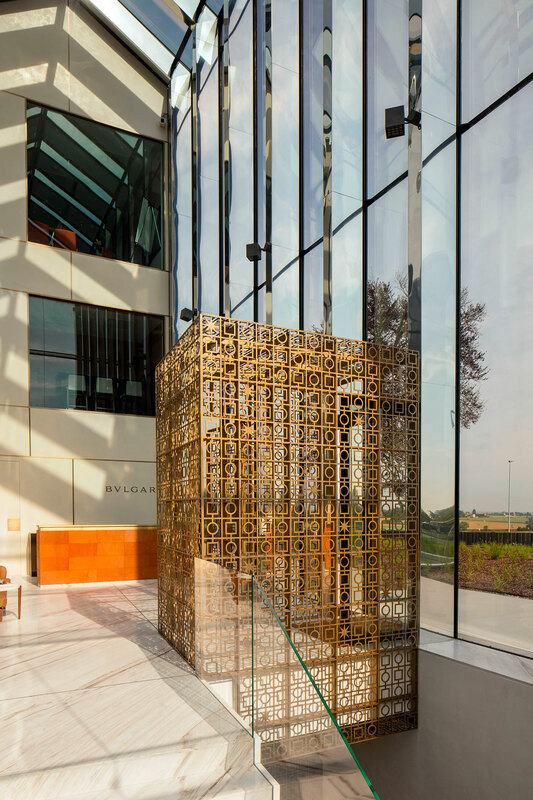 The Glass House is not just a symbol of today’s Valenza’s goldworking tradition, but also a place intended for Bulgari’s representation and hospitality area. Inside, the architectural style and interior design reflect Roman Maison’s unequivocal style. 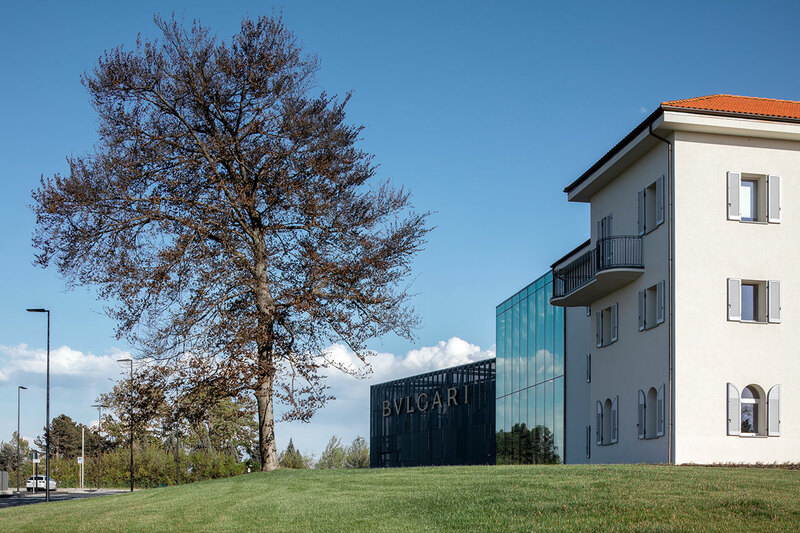 The new steel and glass structure is a technological extension of the historic Cascina dell’Orefice, while in both choice of materials and colors we can find references to Bulgari’s shops. The hall flooring and the staircase leading to the underground areas are in classic rosewood marble, and the revolving entrance doors are finished in metal stamped with Pantheon mesh – this accompanies visitors up to the foyer of the conference room with its beautiful glossy Italian walnut flooring.